A competitive examination for the recruitment of 5201 Apprentice Assistant Development Officers in the jurisdiction of the various Divisional Offices under nine different Zones in the Life Insurance Corporation which will be held on 2 February 2013 and 3 February 2013. The selection of the candidates will be based on performance in online test and interview. The candidates applied for the post have to pass in both the exams separately with minimum marks.The minimum marks in each paper will be decided by LIC of India . The candidates successful in the written examination will be eligible for interview round.The finally selected candidates have to undergo medical examinations.those who are being found medically fit by the Medical Examiner authorized by LIC for the purpose they will be selected finaly. Application Fee: Applicants need to pay Rs 500 ( Other than SC/ST) which will have to be deposited in any State Bank of India (SBI) through a Challan form, that can be Downloaded after Submitting the Online Application. 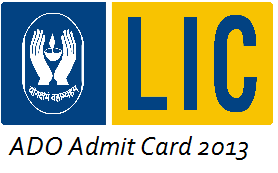 The LIC ADO Recruitment Exam 2013 will be an Online Test. 1. Log on to http://www.licindia.in/careers.htm website. 2.Click on the “Recruitment of Apprentice Development Officers-2012-13″. 3. After candidate clicks the relevant on-line application link titled “Online Application for LIC ADO’s Recruitment Exam 2012-13”. 5. Fill all the mandatory details in the form carefully and click on ‘Submit’ button to complete the online application process. 6. After submission of online application, candidate need to take printout of the system generated fee payment challan immediately and make payment as mentioned above. 7. And also take system generated print-out of the application on A-4 Size Paper and retain it for further use. i. As LIC ADO is a Marketing and Sales Job, so, the first preference will be given to those who have completed MBA in Marketing OR Post Graduate Diploma in Marketing. ii. Also Candidates having Bachelor’s Degree from a University in India established under a statute or a foreign university approved for the purpose or the Fellowship of Insurance Institute of India, Mumbai for Employees category and Agents category in both Urban and Rural area and Bachelor’s Degree of a University in India established under a statute or a foreign university approved for the purpose or the Fellowship of Insurance Institute of India, Mumbai for applicant from Others category for recruitment as an Apprentice Development Officer in both Urban and Rural area. Age Limit: Applicants must be aged in 21 to 30 years. Paper 1 will consist of Reasoning and Numerical Ability. Paper 2 will contain questions from General Knowledge, Current Affairs and English Language with Special emphasis on Grammar and Vocabulary. There will be negetive marking for wrong answers. Candidates have to pass in each paper separately and only those candidates will qualify for the interview who will obtain minimum marks in the aggregate of the two papers. Marks will be calculated after deduction of the marks for wrong answers.